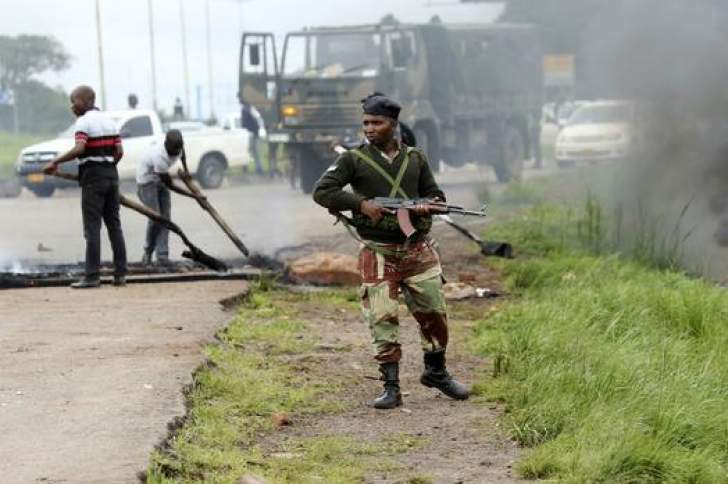 ACTING Prosecutor-General Kumbirai Hodzi has revealed he was not anxious to deal with security details accused of killing more than 12 people during last week's violent fuel protests, but sought to nail those who murdered a police officer in Bulawayo. "No one was killed by the police or any security member, but we have a case of a police officer who was killed by organisers of these protests. We have police stations that were destroyed; we have vehicles that were burnt," he said. Human rights groups have put the death toll from last week's clashes at 12 and more than 68 having gunshots wounds. "I am saying no one was killed by a police officer or a security agent. Let it be known that it is bad for people to kill a police officer on duty. As a law officer, we will not tolerate that," Hodzi insisted. "I want to make a correction on your last question [with regards to people said to have been killed by members of the security services]. Let me say, as far as I know, no law-abiding citizen was killed by soldiers or police," Hodzi said. "I know no such case of a law-abiding citizen being killed, that is as far as I know." When pressed to explain his statement, Hodzi said: "I don't know of any law-abiding citizen who was killed by law enforcement agents. The only thing I know and I am not assuming, but talking based on facts, was that a police officer was killed by organisers of these violent protests and we are dealing with that". Last week, ZCTU called for a three-day national strike following President Emmerson Mnangagwa's decision to hike fuel prices three-fold and the strike turned violent. "We want them to account for their actions. We have people who were blocking roads, looting shops, beating up people and doing all sorts of illegality. We will not tolerate that," Hodzi stated. Hodzi's comments come after Deputy Chief Secretary in the Office of the President, George Charamba, told State media that the State's response to the violence was a foretaste of things to come and that the Executive was revisiting certain constitutional provisions that were being abused by some political parties. "It's a question we will have to deal with as we revisit certain constitutional provisions, which we now know are prone to abuse by so-called proponents of democracy," Charamba said. "In this case, accused persons are being told to face trial before being accorded the reasonable time to prepare their defence. Even where lawyers are involved, they are being told to prepare defence for 10 people within minutes and so on," he said. "There is no way a lawyer can adequately prepare a defence outline for 10 people or even for one person in minutes. Some of the prosecutors are lawyers, they should understand better." "In broad terms, it must be admitted that the speedy finalisation of court cases is an important aspect of the justice delivery system. However, that speed must be carefully balanced with other important legal and procedural factors such as fairness, meaningful representation, and the availability of adequate self-defence materials or facilities," Mhike said. "In terms of section 70 of the Constitution, any person accused of an offence must enjoy the presumption of innocence and ought to be informed of the charge being faced in sufficient detail to enable him or her to answer it, among many other rights," he said. "When a court allows the State to fast-track a trial without affording the accused person the opportunity to exercise their right to liberty through the bail procedure, the presiding judicial officer would have failed dismally in his/her solemn duty to uphold the laws of Zimbabwe and to deliver justice. "The irregularities that have characterised many of the on-going so-called trials are, therefore, a tragic failure by Zimbabwean authorities to respect the rule of law." "We expect that magistrates would exercise their independence when discharging their mandate. If the law is not followed, people should take up the matter to the court of appeal or even seek review at the High Court," he said. "I don't want to be seen as if we are interfering with what is happening at the courts, but the Chief Justice made it clear during the official opening of the legal year that the courts must follow the law. Anyone who feels aggrieved by a decision of the courts can take up the matter with the Court of Appeal or the High Court on review." Hodzi, however, defended his prosecutors, accusing human rights lawyers of attempting to frustrate the judicial system by making "frivolous applications" and said in some cases, acting against the will of the accused person to have trials proceed. "An accused person would have agreed to proceed with trial in the absence of a lawyer and when these lawyers for human rights come in, they then start to some bizarre applications in an attempt to buy time, which I have said no. The accused person, yes, has the right to engage a lawyer at any time, but not to come and delay the case," Hodzi said.